This Thursday Screaming Symphony will be broadcasting live from Wacken Open Air Festival in Germany - the world's biggest heavy metal music festival. Screaming Symphony hosts Gary Carson and Peter Fundeis take things international and will destroy the global airwaves for two hours (10pm-12am AEST / 2pm-4pm CET) of metal mayhem from the world's biggest heavy metal festival, Wacken Open Air in Germany (wacken.com). The festival, which attracts 85,000+ visitors, is situated 80km north-west of Hamburg around the tiny village of Wacken. Now in its 29th year, this year's festival includes almost 200 of the world’s greatest metal bands. "Our first experience with Wacken was in 1999 and a lot has changed since then," says Gary. 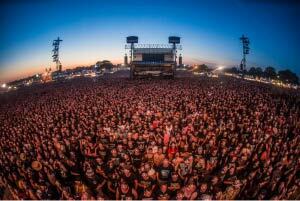 "What hasn't changed is the black-clad metalheads and the headbanging, moshing, and crowd-surfing that is central to the community spirit of Wacken. It's just amplified by a lot more people. Whilst we won't be broadcasting bands as they play live, we hope to bring you some of the madness and mayhem of Wacken Open Air with interviews of fans, bands, and organisers. We really won't know until we hit the ground." The show will be broadcast simultaneously on Wacken Radio and on PBSFM106.7 and is brought to you by Wacken Open Air, RauteMusik.fm, ICS, and PBSFM106.7.